Hello. The "1500" relates to the load capacity of the truck, 1500 kilogrammes, or 1.5 tonne. These trucks came in many configurations, including ambulance & radio vans, and Profiline makes many of these. It appears there was a 2.5 tonne version, one source adds that the only difference in the design was extra leaves in the rear leaf spring assembly to bear the additional weight. Kit Construction Comments. Firstly, most of my 'in progress' pictures have been deleted from my camera's memory card, so I can't show many 'in progress' pictures, but comments are below. The hardest part of this build is fitting the cab parts together. You need to have the doors ready to place in, to get the shape of the cab right, and the doors still need a light sand to fit in correctly. Also filling and sanding needed where the cab roof meets the front windscreen. The bonnet and mudguards should be assembled as a separate unit, no issues with them, though take note bonnet and the cab firewall should not be a flush join, as I have assembled. There should be a tapered strip between them, I'm unsure of just how wide this should be, some photos seem to indicate it varies, if you can track down good references or plans you can assess how wide it should be. Bear in mind that 1 millimetre equates to more than 72 millimetres in the real world, so it will not be very noticeable anyway, and will require a minimal adjustment for forward positioning of the front axle. The kit also has no gear or brake handles in the cab, the real one has 4 floor mounted levers, I made some from wire, and small round knobs were attached (that came from the inside of a water filter). Other minor changes are a replacement of the Notek light and its mount from the spares box and a piece of wire, (this was not an essential change, you can use the kit one, as similar types do exist in period photos) & replacment of door handles with filed and bent wire, & replacement of spare tyre holder with a strip of styrene. I also carefully countersunk a hollow on the front of the bonnet with a drill bit, as this is not properly moulded on the kit, and made a 'T' shaped hood release to place in it, from stretched sprue. To prevent disfiguring the 'T' shaped handle with polystyrene cement, I used a tiny drop of "window maker" applied with a toothpick, which dries invisible. The rear differential is cast very flat, I found it hard to find any good references on the web to check how it should look, its virtually unseen anyway. The drive shafts were also too short, but these were replaced with stretched sprue. Window wipers courtesy of Ilian Filipov who etches exquisite sets, so fine that the blades can be adjusted on the wiper arm, to make them properly 3 dimensional. 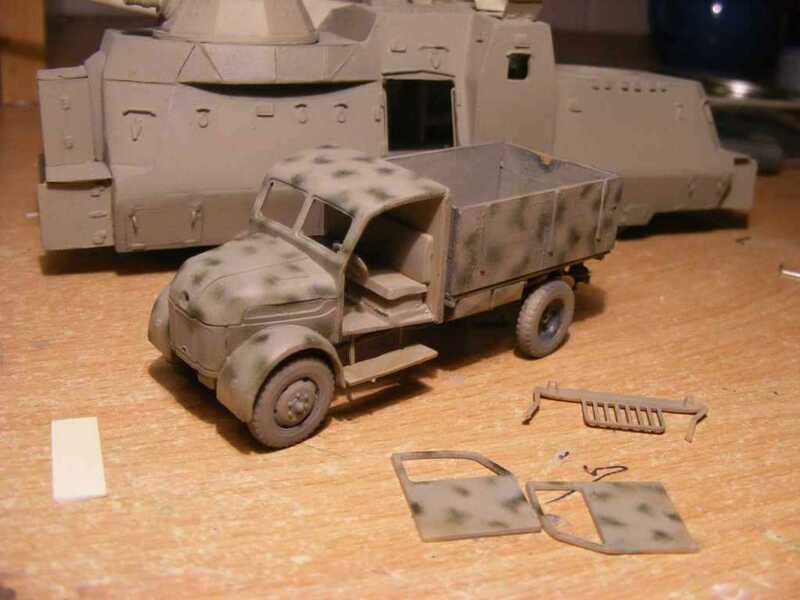 I also need to make wire width markers to affix to the front bumper, the kit ones were not particularly well cast, and one was damaged in the kit, the kit box was damaged by the postal service.Kit was painted with Floquill 'Cement' and camo spots were done with a Lifecolor acrylic green. Detail touched up with Citadel acrylic wash, Badab Black, dust was sprayed with Model Master dark tan enamel, diluted. I cut masks for the window wiper paths from paper and held them in place with a tiny amount of Blu-Tack and did a light pass with spray gun to 'dirty' the unmasked part of the window.